This week we are featuring all things BUGS as we kick off our Virtual Book Club Summer Camp! If you haven't signed up for our VBC Summer Camp weekly email planner, you can click here to sign up. Every week of camp you'll receive themed book lists, activity ideas, materials lists, and some other great info to make your summer awesome. 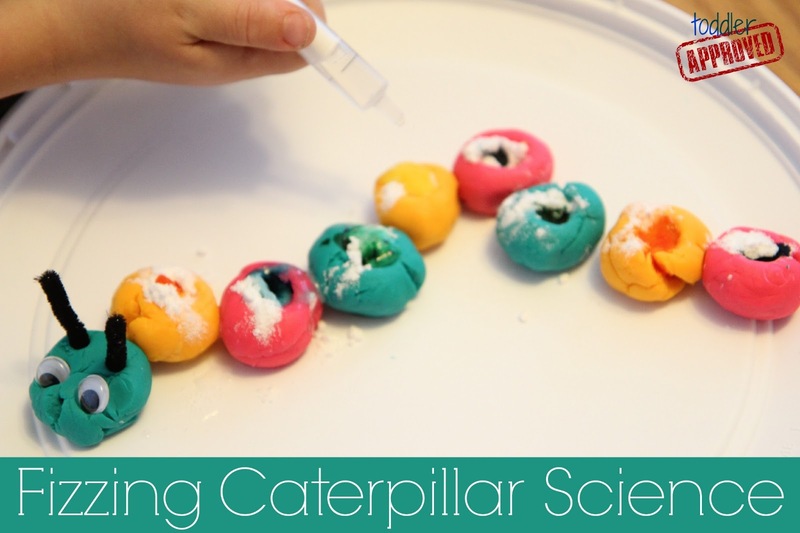 For our first Featured Bug Week post, we are sharing a simple science activity that combines five of our favorite items... baking soda, vinegar, playdough, food coloring, and googly eyes! Before we got started with our science activity, we read The Very Hungry Caterpillar by Eric Carle. Have you read it yet? We love to read both the board book version with my 8 month old as well as the hardcover version with my toddler and 5 year old. The book doesn't seem to get old at our house. Once we read the book, we talked about what caterpillars looked like and made our own using some playdough. I prefer to buy store bought play-doh, but if you like to make your own playdough, you can find a bunch of great recipes in this post A to Z of Play Dough Recipes and Activities by The Imagination Tree. We love finding ways to connect books we read with simple science activities, so we decided to make our playdough caterpillars fizz! *the playdough gets wet in this activity, so cannot be re-used afterwards for other molding/building activities. First we made caterpillars with playdough and added pipe cleaner antennae and googly eyes. You can also add pipe cleaner legs (my kids opted not to do that!). :) While we made our caterpillar we counted each ball and talked about the simple color patterns we were creating with them. Next make a good sized thumbprint in each caterpillar segment. While we made our thumbprints we counted our playdough balls again. Fill the thumbprint sized hole with baking soda and if you would like, add one drop of food coloring to each hole. Then, ask your kids what is going to happen. Make some predictions. If they say that there is going to be some fizzing or little explosions, have them predict which side of the playdough balls the liquid is going to run off of as it explodes. Have them also predict which colors they think they'll see as the eruptions happen. Once they've made their predictions, have your child fill up an eye dropper/pipet/straw (or a syringe, like we used) and drop some vinegar on top of each caterpillar segment. The colored fizzing explosions were a hit with my kids. They were content to do this activity again and again and again. If you want the fizzing to last longer, you can add some dish soap into the baking soda/vinegar combination. We did this activity all together one time and then each kid made their own creepy crawly playdough creation and we did it yet again. Then we just kept adding more vinegar, baking soda, and color to continue the eruptions. After a gazillion eruptions, the playdough was super slimey, so we set it aside. Fortunately, if you pour off some of the liquid into the sink, you can let the playdough dry out a bit and do the activity again the next day. We sometimes keep a tray around for a few days...or until the kids are ready to move on... or make new bugs! We also sometimes do this activity on lined paper plates, but the liquid eventually soaks through, so you need to be careful how long you leave your fizzy bug creations out. Do your kids like fizzy science? What is your favorite baking soda/vinegar activity? Later this week we'll be sharing another fizzy bug activity with you, so make sure you stop by again. Tomorrow our Virtual Book Club Summer Camp Featured Activity will be over at The Educators' Spin On It. If you want to keep up to date on all of our Virtual Book Club activities, make sure you stop by our Virtual Book Club Summer Camp landing page or VBC Summer Camp Pinterest Board. If you have a science lover at your house you might also enjoy checking out this great Science Pinterest board hosted by Red Ted Art and many other fabulous bloggers. If you have a child who is 6 or 7 (or older), you may want to check out some of these fiction and non-fiction book titles that are great for middle elementary aged kids. Instead of making a caterpillar, have your older child select an age appropriate bug book from the list above and make a playdough replica of the insect they chose to read about/study. If you have some extra time, have them get on the computer with you and research and then and print out a simple bug diagram of their chosen bug. They can use the diagram to make sure their playdough bug is accurately created. 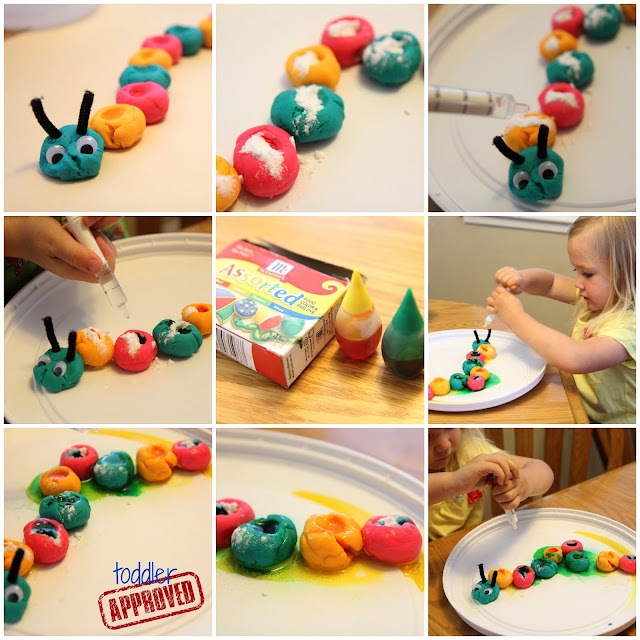 Once they've created a playdough bug replica and learned a bit about the bug body parts, they can turn their bug into a fizzy bug using the instructions above! If your child is extra excited about bugs, use your camera to video tape him as he presents the information he learned about the bug he chose to build. If you need more Bug Ideas, make sure to check our our Virtual Book Club Bug Week Pinterest board. Stay tuned for some awesome giveaways from some of our partners and sponsors later this week and next week! What fun! I know my son would love the fizzing!